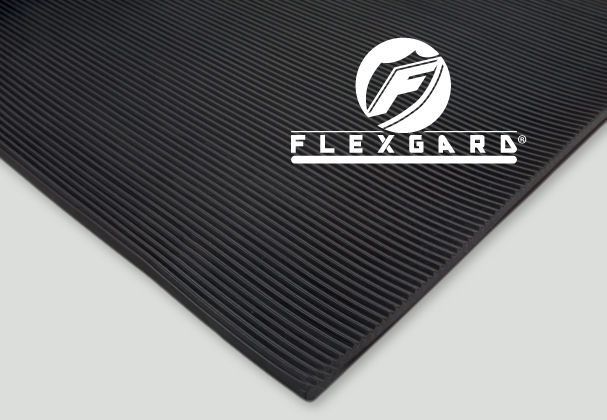 RM Biltrite™ Flexgard® Corrugated Matting is specially compounded for use as a floor covering. Backside has a smooth finish. Most widely used where floor protection and safety are vitally important. Applications include general use in industry, home and office. Commonly used in heavy traffic areas. Also used on hard floors, aisles, and behind counters to reduce fatigue. Most widely used where floor protection and safety are important as well as a component to anti-fatigue matting. Use thicker matting for extra heavy duty service. Product strengths include all-weather, sound absorption characteristics, cleanability and wear resistance. Will not curl, shrink, or separate. Corrugated rubber matting can also be used as a liner for maintenance and tool carts. Easily beveled and perforated for entrance or drainage mats. Product strengths include extended wear, all-weather, excellent cleanability and wear resistance. Will not curl, shrink, or separate. Corrugated rubber matting can greatly increase traction and thus aid to prevent slips and falls while offering greater flexibility.